The Foreign Exchange refuse to be boxed in. If you haven't figured that out already then you probably really aren't all that familiar with this outstanding project that pairs the production genius of Nicolay with the vocal talents of Phonte. On their third album Authenticity, TFE do not in any way try to duplicate the success of their previous album Leave It All Behind, but instead venture into new sonic territories. While Authenticity may be more downbeat and melancholy than previous albums, taken on its own merit it is a gorgeous and extremely layered piece of work that finds Nicolay and Phonte truly stretching themselves to their creative limits. There has always been a touch of sadness within the Foreign Exchange's music but on Authenticity that aspect is brought to the forefront. Lost love, crumbling relationships and general love woes seem to take up most of the album's running time, but this sadness is also reflected in the sound. The album's first half takes on a downtempo vibe that perfectly reflects the melancholic lyrics. The best of these is the album open "The Last Fall", a dramatic and decidedly retro track in which Phonte declares "I'm never gonna love again." It is a severe departure from LIAB's more sunnier relationship outlook. Midway through the album delivers its highest points. The Darien Brockington assisted "Don't Wait" is a real stunner of a track that recalls the best of 80s R&B. Jesse Boykins III shows up on "Don't Make Me A Fool", which is the only time the album really goes for the hip-hop flavored soul that many have come to expect from this collective. But it is becoming increasingly evident that Nicolay and company have created a very unique space with the Foreign Exchange. With Authenticity they have further expanded their sound to include elements of blues, folk and country with equal amounts of love and respect. Their sound is a constant evolution of ideas from the classically trained and experimental Nicolay and the American R&B and hip-hop sensibilities of Phonte that never fails to surprise with its complexity and beauty. Fall is a beautiful season. It's that time of the year when all that was transitions into what will be. Lovers reintroduce themselves as the leaves decorate the pavement through a cluster of colors. 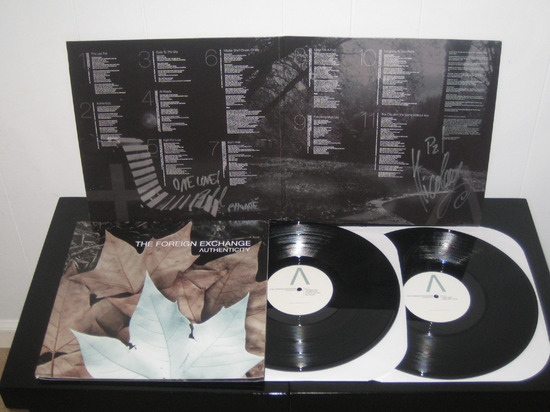 And while all that surrounds us settles into its proper place, The Foreign Exchange reemerges with their third album that captures this transition perfectly. Drenched in love, clarity, anguish, and everything in between, Phonte and Nicolay bring forth an experience that is just as their album says--authentic. Nu-Soul had the opportunity to catch up with The Foreign Exchange and speak to them about their new album Authenticity, how they maintain their creative autonomy, and the greatest lesson that they've learned from each other. Nu-Soul Magazine's +FE Music Interview Series Part 3: Zo! Lorenzo Ferguson aka Zo! is the epitome of the music producer. The multi-instrumentalist, former baseball player and current public school educator has long been someone whose music was loved, but whose face was never seen. With the release of his highly anticipated project, SunStorm, we get to see the man behind the music in a whole new light. Zo! is a man whose music I've come to love over time. Not just for the incredible production, heartfelt lyrics, or haunting melodies, but for the realism and honesty that is conveyed on each track. His latest project, SunStorm, an autobiographical album that is the culmination of a musical journey, is his best work to date. While his musical resume grows and he continues to hone his craft, this musical architect creates feel good music for the soul. Continue reading Nu-Soul Magazine's +FE Music Interview Series Part 3: Zo! "Y'all motherfuckers trying to get that Grammy again!" That's Phonte Coleman--the songwriting, singing and sometimes rapping half of the experimental soul group The Foreign Exchange, impersonating the potential detractors of his group's new, disarmingly serious record, Authenticity. Their last album, 2008's Leave It All Behind, received a Best Urban/ Alternative Performance Grammy nomination for the song "Daykeeper." Nicolay Rook, the group's producer, laughs at the all-too-real impersonation, stealing a glance away from the heaping plate of hush puppies in front of him. The duo has again rendezvoused on a Wednesday afternoon in late October, at the Smithfield's Chicken 'N Bar-B-Q restaurant in the little town of Warsaw, off Interstate 40's Exit 364. The stop is equidistant from Rook's Wilmington home and Raleigh, where Coleman resides. Radio 6 presents Holland's Got Soul. When the Foreign Exchange - a musical collaboration between Raleigh-based vocalist Phonte and Dutch-born, Wilmington-based producer Nicolay - was nominated for a Grammy last year, the duo knew they couldn't rest on their laurels. So they stepped up their game. Even before the hype had faded, even before the Grammy for Best Urban/Alternative track went to India.Arie in late January, Phonte (a former member of N.C. hip-hop group Little Brother) and Nicolay put other plans on hold to start work on what would be the group's third album. That album, "Authenticity," released in October by the group's own Foreign Exchange Music label, debuted at No. 145 on the Billboard top 200, a respectable ranking for a purely independent record. When it comes to my music, there are few artists that affect me in a way that defines a whole portion of my life. In a sense, some artists become the soundtrack of my life because of how much their music lyrically and sonically means to me. At times the reason for the choice is simply because you enjoy the music. But at times there are songs and albums that not only become our favorites because of the sound but because of the parallels between life and song. When the meaning of the song has a connection to your life's experiences, it becomes a much deeper emotional experience. The Foreign Exchange and their band of merry musicians are certainly in that category for me. After seeing FE perform at BB Kings back in 2009, my fiancée and I made sure that we would not miss their return to BB Kings on Oct. 23rd, 2010. Arriving early to the scene, we were greeted by the sounds of DJ Brainchild spinning an eclectic mix of hip hop and funk. Experiencing everything from Slum Village to Barry White, the crowd spilled into BB Kings anticipating yet another amazing performance for this year's CMJ Festival. The new FE album "Authenticity" clocks in at a polished eleven tracks, with the memorable "Everything must go" starting off with a synthesizer melody that hypnotizes from start to finish. "This city ain't the same without you" utilizes fan favorite Yazarah's vocals. MTV picking up "The Ballad of Purple St. James'" first video for rotation is as just a much a testament to the FE+ label, as is the newest tight knit ZO! full length. Nicolay's solo catalog continues to develop over time, and "Don't Wait" provides the proof Darrien Brockington's eventual solo album is long deserved. I have no doubt we'll see a rise in notoriety of all of the artists in the collective in the not so distant future. It takes courage to reinvent yourself as a silky soul crooner after developing a hard-earned reputation as one of the most insightful, funny, gifted rappers around, but former Little Brother frontman Phonte has never lacked chutzpah or ambition. The Grammy-nominated renaissance man's first collaborative album with producer Nicolay, Connected, joined the hip-hop boom-bap of Little Brother with shimmering electronic soul. Its follow-up, the aptly named Leave It All Behind, all but abandoned rap, as does the duo's assured new Authenticity, a warm, comforting security blanket of an album. It's a work of hushed intimacy and unabashed romanticism that uses synthesizers to create incongruously organic, natural-sounding grown-folks R&B. The disc sometimes feels like one long, hypnotic, deeply soothing groove separated into tracks, but the sprightly "Maybe She'll Dream of Me," which features Phonte's sole rap on Authenticity, feels like a hit single from an alternate universe where pop music is a meritocracy instead of a rigged game. Phonte exposes his soul in song after song; like a bona fide soulman, he's fearless about broadcasting his softness and vulnerability. Thankfully, he's now in a gentler R&B realm that, unlike hip-hop, sees those qualities as strengths rather than weaknesses. It's one thing for musicians to change their sound gradually and still remain uniquely them. It's another thing altogether to jump ship from album to album and still maintain a sound that belongs to you. The Foreign Exchange (which consists of singer/rapper/songwriter Phonte and producer/musician/arranger Nicolay) has done exactly that. Starting with 2004's firmly rooted in hip-hop Connected, moving to 2008's modern-day classic R&B sound on Leave It All Behind and ending with their new release, Authenticity, the duo have once again changed their sound and created another successful work of art. The Foreign Exchange, last year's surprise Grammy-nominees, return with their newest set, Authenticity. The team of Phonté Coleman and Nicolay continue on their foray of making beautiful soul music with a sound similar to their last album, the heralded Leave It All Behind. Nicolay's production shows more maturation, even more so when compared to Foreign Exchange's hip-hop heavy debut, Connected. Tracks like "All Roads", "Fight For Love" and "Don't Wait" all display Nic's lush and developed soundscapes. With YahZarah and Darien Brockington returning, Phonté continues his transformation from being one of hip-hop's most clever wordsmiths to soulful singer-songwriter extraordinaire, expertly penning songs about love, love lost, it's positives and, definitely, it's negatives. But that's what Authenticity is about: Love, and everything it entails, good and bad. If you dug LIAB, then Authenticity should not disappoint. We always knew Phonte could sang. His career in North Carolina's Little Brother was peppered with turns as a vocalist, most memorably on The Minstrel Show's "Cheatin'", an uproarious send up of mainstream R&B's penchant for cartoonish melodrama. Still, though, when Tay went full on crooner for Leave It All Behind, his and Dutch producer Nicolay's second album as the Foreign Exchange, it was a bit of a curveball. Even so, Tay and Nic made it a smooth transition with an album full of Nicolay's stellar production and Phonte's smoothly sung loverman platitudes. This is a group that never hesitates to challenge its fanbase with each work, and Authenticity is no exception. Where Leave It All Behind was an ode to being in love, Authenticity trafficks in stories of exhaustion, resignation, and quiet, mannered desperation that find the group exploring new musical territories.